Joy is the Vice President of Localworks’ Board of Directors and has been a Localworks supporter since 2014. Her love of Wheat Ridge is evident in all that she does. Learn more about Joy and her amazing contributions to our community below. I am a Colorado native and when I’m not out on the trails with my family, I’m all over metro Denver working with buyers and sellers in a profession I’m passionate about: residential real estate sales. I have been in real estate since 2004 and have navigated all the ups and downs of the Denver real estate markets. Armed with a degree in journalism from The University of Kansas and a strong background in telecom engineering and project management, I am a Realtor with a diverse perspective. I am the mother of a high-schooler, Amanda who attends Lakewood High School and is active in track and field as a thrower. My husband was raised in the Wheat Ridge Applewood area and also has gained a lot of satisfaction from his volunteer work at events and while serving on the Cultural Commission. 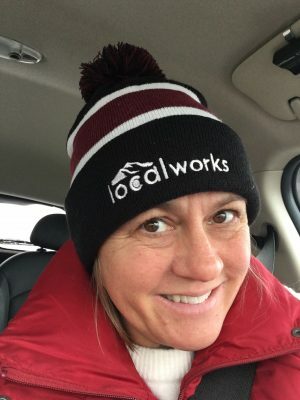 How did you get involved with Localworks? In 2014, I volunteered on the home selection committee for the Mid Century and Modern Home Tour. I loved getting to know the fabulous mid-mod homes in Wheat Ridge. The next year, I joined the board of directors and became involved with the planning committee for Friday Night Live. I was nominated to the Executive Committee in 2017 as Secretary, and now, I am Vice President. What other local organizations are you involved with? In 2017, I was selected to serve on Wheat Ridge’s Environmental Sustainability Committee with the assignment of drafting the city’s sustainability action plan. I now serve as the co-chair of the committee and have the honor of serving along side some very smart people as we work to implement this important work. Because I absolutely love houses and am a huge enthusiast of the mid-century design style, my favorite program is the Wheat Ridge Mid Century and Modern Home Tour. I love seeing how people have created spaces in their homes that are livable and comfortable and also reflect the nostalgia of the iconic 1950s design. What do you love about Wheat Ridge? What I love most about Wheat Ridge is the perfect location within this amazing metro area. I love that I can hit the trails easily and also head into the city for sporting events or theatre. An accessible location is important for my career in real estate. But while it’s great to get out and explore, Wheat Ridge feels like home. When I drive down these familiar streets and see my neighbors at our community events, I feel so lucky to live here.